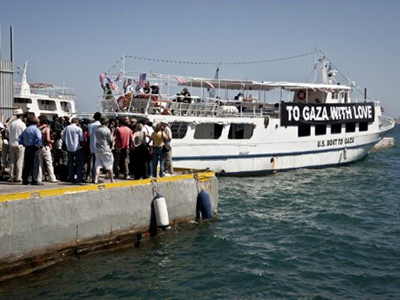 Hundreds of pro-Palestinian activists are trying to reach blockaded Gaza by air, after several ships among an aid flotilla were forced to dock in Greece. Ramped-up Israeli security is waiting for them at Tel-Aviv's largest international airport. Tensions ahead of the “flytilla” arrival are running high at Ben Gurion Airport some 15 kilometers southeast of Tel Aviv. Dozens of activists are being interrogated at the airport, and only a few have managed to trickle through the security checks. It is not quite clear why the Israeli police and security allowed them to go through. Israel’s Foreign Ministry said an unspecified number of activists had been allowed through the terminal without incident, although Israel has not publicized any criteria for denying entry. A handful of local protestors were holding up signs saying “welcome to Gaza”, and “free Palestine” supporting arriving activists, while Israeli passengers were shouting “traitors, go to Syria!” Almost immediately the police shuffled local protestors out of the terminal building into waiting police vans outside. Israeli security forces have detained 30 pro-Palestinian activists who managed to break the air-blockade and arrive in Israel, AFP news agency reported. Ten of the activists were on an easyJet flight, while another 20 were on board an Alitalia plane. Both flights landed at Ben Gurion Airport. However, they were diverted away from the main terminal where they were detained by police. The air-blockade is more or less preventing activists from arriving at the airport. A flight that arrived from Geneva with some 50 activists aboard has been diverted to another terminal. Two American citizens who arrived in Tel-Aviv have already been deported. Meanwhile, a protest broke out in a Paris airport after passengers were prevented from boarding flights to Israel. About 150 people shouted anti-Israel slogans, sitting on the check-in desks at Charles de Gaulle airport, the Associated Press reported. Some 600 activists are expected to arrive on Friday by 15 different planes to show their support for the Palestinian people. They are converging at Ben Gurion International Airport. Outside and inside the airport there are some 500-600 police and security officers on standby. The situation remains tense, with some journalists sarcastically commenting that one might think the police are expecting an invading army rather than peaceful protestors. 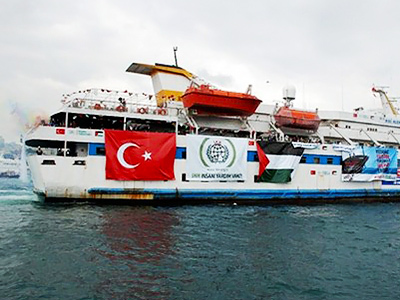 The action was dubbed “a flytilla” as opposed to the flotilla which has been held up in Greece with some ten ships being refused permission by Athens to sail to Gaza. Activists say they want to highlight the plight of people not only in Gaza but also across the West Bank and throughout Palestinian territory. The activists announced that they intend to travel to Palestinian territories and have a number of activities planned over the next week, although they expected that Israeli authorities will not allow them to carry out their actions. The campaign is non-violent, organizers stressed. An Israeli immigration spokesperson said a list of some 350 names of unwanted persons has been sent to airlines, warning that they will be turned back at the expense of the airlines which delivered them, if they come to the country. 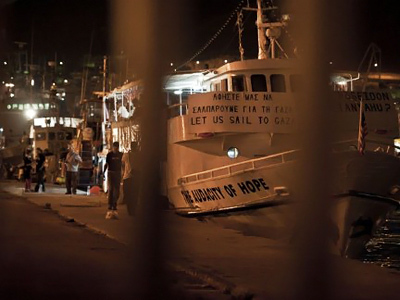 She added that "the companies have already refused to take on board around 200 of these passengers," reports AFP. Israeli leftists have called for a boycott of the airlines which cooperated with their government. Traditionally, when somebody declares they are going to take part in pro-Palestinian activities in Israel, they face strong resistance and deportation. Five French and Belgium activists have been detained and told to leave Israel this week. Israelis are calling the activists troublemakers and hooligans. Prime Minister Benjamin Netanyahu stated that they will be dealt with “as they need to be dealt with”.